A major change in the Victorian era was attributed to the Industrial Revolution owing to which there were numerous changes in the lives of the Victorian people. The late Victorian era includes changes in the social structure, the fashion, and style of clothing, architectural changes, etc. The women’s fashion had undergone radical changes during the Victorian period. However, it was during the later years that the drastic changes were brought about in fashion and design of the Victorian women. By 1860, the skirts were flat at the front as compared to the bell-shaped skirts worn by the early Victorian women. The day dresses had pagoda sleeves and a high neckline. These necklines either had a lace or tatted collar on them. However, for the evening wear, the gowns had low neckline and short sleeves along with appropriate gloves. Somewhere in 1870, tea-gowns were introduced for casual get-togethers at home. By 1867 Crinoline was replaced by Bustles to hold the skirts up. The invention of sewing machine in the late 18th century enabled the women to wear sewn clothes. The use of machine brought about a lot of change in the clothing fashion. Jacket and skirts which matched the hunting outfit were worn in 1880s. The shirt was high collared and the top-hat had a veil. Women did not use bustles and crinoline and the dresses were no longer tight fitted. Corsets were longer giving the women a slight S-curve silhouette. Skirts worn were closely fitted over the hip and flared just above the knees. Late Victorian women preferred high necks and puffed sleeves. Also sportswear like bicycling dress, tennis dress were worn by women. The sleeves changed from slim to leg o mutton sleeves at the end of Victorian times. By 1895 the sleeves were very puffed like those worn by women in 1833. The late Victorian women wore sharper tailored jackets which gave them an altogether different posture and confidence. 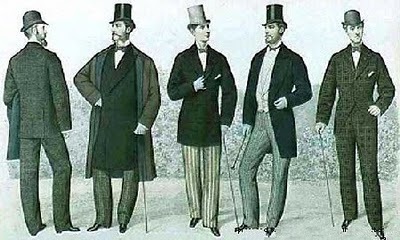 During 1860s men’s fashion underwent a change. The neckties were wider and were to be tied in a bow or looped into a loose knot and tied with a stickpin. Another change that took place was that the frock coats became shorter. Now, they reached up to the knee length as against the previous ones reaching the calf. Three-piece suits were invented around 1870s and instantly were a hit among the people. Another change that was brought during this time was in ties. Neckties were four-in-hand and a new type, known as Ascot ties soon became popular. By the end of 1880s, men had starting wearing the newly introduced blazers for outdoor activities like sports, sailing, etc. the shoes of the Victorian men had high heels and were narrower at the toes. Men usually kept their hair short and had pointed beards and generous moustaches. Thus, it can be said that men’s clothing was formal and comparatively, few changes were brought in men’s fashion. During the 1850s and 60s, small girls wore crinoline petticoats like their mothers. There was a significant difference between the clothes worn by girls and their mothers. The length of the skirts worn by little girls was short than their mothers. 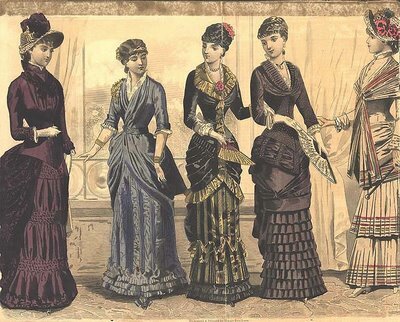 The narrow skirts that were more restrictive were in vogue in 1870 and 1880. Sailor suit first seen on Queen Victorias eldest son was popular for both boys and girls. In the 1890s, it was acceptable for girls to wear loose fitting dresses and separate skirt and blouses. The major difference in the clothes of Victorian era and the clothes worn today is the number of layers worn underneath. A girl first wore a chemise (loose fitting shift), then long knickers, stays (softer corset), stockings and a minimum of two petticoats. The clothes worn by girls were of light colors. 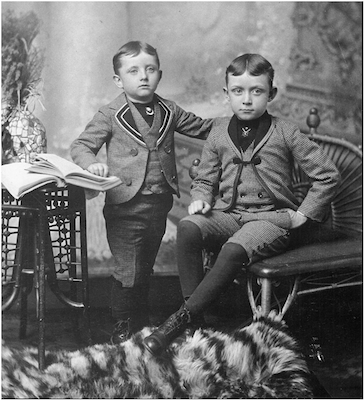 The fashion for boys remained more or less similar throughout the Victorian period. The clothes worn by boys were of dark or bright colors. Fauntleroy suits were in vogue for boys, which consisted of a velvet tunic or jacket with corresponding breeches and a lace collar. The sailor suit first seen on Queen Victorias eldest son was popular for both boys and girls. Boys in the Victorian era wore dresses instead of breeches or trousers till they were five years old. 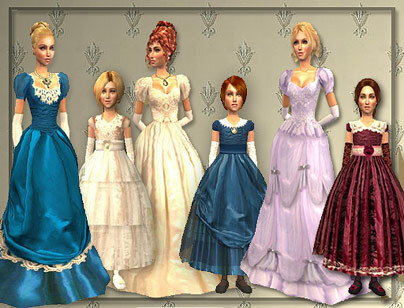 The dresses were made shorter as they reached the age where they learned to walk. There were no specific dresses styled for the boys. It was common for boys to wear dresses until they were five years old, but as such there was no set age as to when can the dresses be worn. In majority of families the boys clothing was a matter decided by his mother. A boys dress was commonly worn over similar drawers or pantalettes. Tunics were worn by younger boys after breeching.